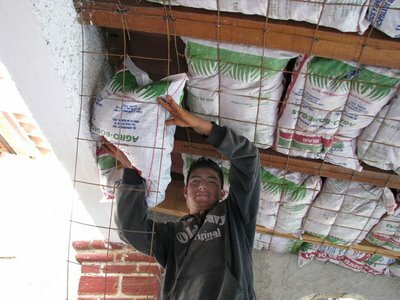 Dr. Owen Geiger and I have collaborated on a new article posted at earthbagbuilding.com that describes how to use earthbags filled with various natural insulating materials to insulate ceilings or roofs. There seems to be a general lack of interesting ceiling options using sustainable building materials. For instance, when touring otherwise beautiful straw bale homes one often sees sheetrock covering conventional industrial insulation. 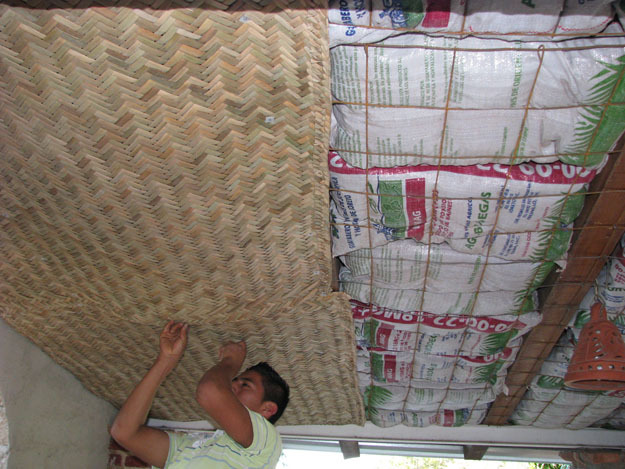 Instead of using fiberglass batts or even manufactured cotton batts to insulate a roof, it is possible to use earthbags that are filled with a variety of insulating materials. These materials include rice hulls, crushed volcanic rock (such as scoria), vermiculite and perlite. The insulating value of these ranges from about R-2 to R-3, so they are quite effective, and can also be quite inexpensive to install. This article also describes how one might use mats made of natural fibers to cover and finish these earthbag ceilings. Suspended ceilings, as described in this article, have a number of benefits. They conceal the roof structure, plumbing, venting and electrical wiring, as well as improve acoustics and insulation. And they can also greatly enhance the ambiance or hominess of a room. The earthbags are intriguing. I can appreciate the natural contents,but what about all that plastic used to make the bags? Unless they are corn-based bags? Joyce at GreenStrides. It is true that polypropylene bags are synthetic, and thus not so natural, but the relative amount of this material is quite small compared to the mineral material used to fill them. I built a whole house with bags that fit into the back of my station wagon. Also, it is possible to use burlap, which is a natural material, although it is not as strong as the polypropylene. Another consideration is that the poly will actually biodegrade if left exposed to the UV in sunlight. An interesting idea would be to have the wood pellet manufacturers provide the product in earth bags instead of the plastic bags they currently use. We like using pellets - one reason being the envromental impact - but the bags still pose a problem. I bet many people would be willing to collect them and drop them of at a re-use depot if they had a "target" final use in building. This is a great idea. What are the deterioration qualities of a roof like this? Since all of the materials are protected from the elements by the roof itself, they should last a very long time. UV in the sunlight is about the only thing that degrades the polypropylene bags; the insulation material inside the bags should last for centuries perhaps; and the matts should last a few decades generally. This looks like the perfect solution for the cabin I'm finishing right now. Would you just stuff the bags in right under the roof, with mesh stapled to the roof rafters? Would it need additional airspace and venting between the bags and the roof, or could it go right on? Yes, I put the bags right up against the roof between the rafters and supported it with wire mesh below. There is no need for airspace. I wonder how effective it is. Because if this method of insulation works better than ordinary insulation and turns out to be cheaper then that means more people will most likely choose this method as they will probably feel safer doing so.